Schirokko, that is the name of the hot wind which makes it's journey over the ocean to our continent, carrying with it the sands of the Sahara all the way to the Alps. 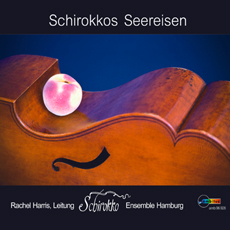 Schirokko is also the name of a rising star on the early music skies, an ensemble led by Rachel Harris. Represented on this CD is the fascination of baroque composers for Greek mythology: naiads, titans, nymphs and gods of all kinds are to be found. After the initial chaos, where the world orders itself correctly in the French manner, Aeolus ruler of the winds, and Eros lord of new love can go about their mischief. Telemann describes how Peleus surprised the sleeping sea-nymph Thetis, and how she by constant changing of shape attempted to escape. All this is woven together to make one story: the origin of the world.